To add a video card to your computer, you have to pick an expansion slot. There have been many kinds of expansion slots over the years so most motherboards contain more than one kind of slot. They usually have a few of the older slots and a few of the newer ones. The slots differ greatly in speed so you need to pick the right kind of slot. The motherboard shown above includes most of the slots that you'll run into these days. It's a little unusual in that you don't often see motherboards which have both PCI-Express slots and an AGP slot. The best slot to use for video cards is the PCI-Express x16 slot. The next best is the AGP slot. The next best is a PCI-Express x1 slot but video cards which fit that slot are very hard to find as of late 2006. The worst choice for a video card is a PCI slot. If you're building or buying a new computer then be sure to get one with a PCI-Express x16 slot. You shouldn't buy anything else. Some low-budget computers are sold with integrated video and have neither a PCI-Express x16 slot or an AGP slot. With that kind of computer you're stuck using a very slow PCI slot when upgrading your video system. You definitely want to avoid that situation. Many low-budget computers with integrated video include either a PCI-Express x16 slot or an AGP slot so be sure to get one of those. That way you'll have good choices available if you decide to upgrade your video system. If you only have a PCI slot then your upgrade choices are extremely limited, underpowered, and overpriced. In PCI-Express x16, the "x16" part is pronounced, "times sixteen" or "by sixteen". The number following the "x" is the number of PCI-Express lanes in the slot. The more lanes in the slot, the faster it can go. The motherboard picture above shows both a x16 slot and a x1 slot. Video cards are normally designed to fit in x16 slots since they are the fastest. You can also get video cards designed for x1 slots. Those are normally used only if you want more than one video card in the computer. Most motherboards have one PCI-Express x16 slot for a video card and one or more x1 slots for other things like network adapters. Less common are x4 and x8 slots. You can "up-plug" PCI-Express cards. That means that you can plug a PCI-Express x1 expansion card into a PCI-Express x1, x4, x8, or x16 expansion slot and it will work (as long as the motherboard BIOS doesn't have bugs). The x1 expansion card can only run at x1 speed in any of those slots but it will work. Likewise, you can plug x4 expansion cards into x4, x8, and x16 slots and you can plug x8 expansion cards (if you can find one) into x8 and x16 slots. But you can't "down-plug" PCI-Express cards because an expansion card with a higher number of lanes (the "x" value) physically won't fit into an expansion slot with a lower number of lanes. For example, a x16 expansion card won't fit into a x8, x4, or x1 slot. When it comes to video cards, some motherboards can be extremely picky about up-plugging. You should always be able to plug a x1, x4, or x8 video card into a x16 PCI-Express slot and have it work. It may only run at x1 speeds but it should work nonetheless. Unfortunately, many motherboards have problems with video card up-plugging. As time passes, the motherboard BIOSes should have better support for up-plugging video cards but for now it may not work. Plugging a x16 video card into a x16 slot always works and plugging a x1 video card into a x1 slot almost always works but the other combinations may not work properly. If you have problems up-plugging a video card then you should go to the motherboard manufacturer's website and update the motherboard BIOS. That's where they will fix problems with expansion card up-plugging. Some motherboards come with two PCI-Express x16 slots so you can run two full speed video cards at once. This is normally used only by serious gamers who want the highest possible performance in 3D games. NVIDIA has a dual-card implementation called SLI and ATI has a version called CrossFire. In these modes, both video cards work together on the same game to increase performance. 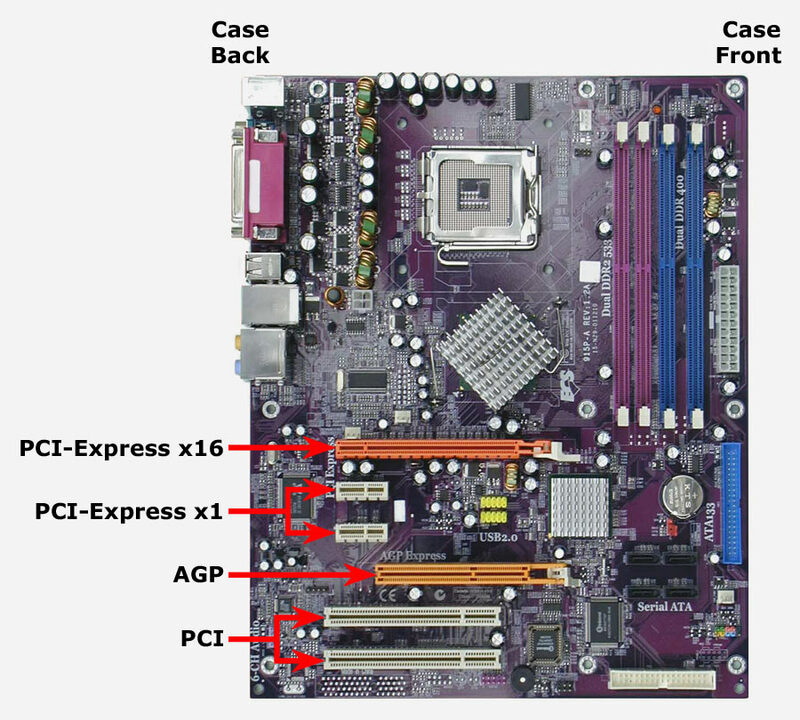 Many motherboards with two PCI-Express x16 slots have special rules about using the second x16 slot. With some motherboards you have to plug a small circuit board into the motherboard to enable the second x16 slot. Even when enabled, the second x16 slot may have special restrictions. In some cases that slot may not work with anything but video cards. The manual of a dual x16 slot motherboard will tell you if there are any restrictions related to its x16 slots. Don't assume that you can treat them like "normal" PCI-Express slots unless the motherboard manual says so. The AGP slot was the standard slot used by video cards before it was replaced by PCI-Express x16 slots. They are four different AGP speeds. AGP 8X is pronounced "AGP eight times". The eight refers to the speed. There are also slower speeds of 4, 2, and 1 times. When it comes to games, as of late 2006, there is very little speed benefit in going faster than AGP 4X (about 1 GB/s). You gain at most a few percent by going from AGP 4X to a faster slot. As time passes it will make more of a difference. As of late 2006, AGP has a much more limited selection of video cards than PCI-Express x16. AGP cards are usually more expensive than PCI-Express x16 cards in the same speed range. On top of that, the fastest video cards are not available for AGP at all. Basically, AGP is in the process of being orphaned. If you're getting a new computer then make sure that it uses PCI-Express x16 rather than AGP. You do have to be a little careful when getting AGP cards because not all AGP cards are compatible with all AGP motherboards. If you go shopping for AGP cards right now then all you're likely to find are "AGP 8X, 4X" cards. Those are compatible with any motherboard which supports AGP 4X or AGP 8X. But there are some old AGP 2X or AGP 1X video cards and there are also old AGP 2X or 1X motherboards. New video cards may not be compatible with old motherboards and old video cards may not be compatible with new motherboards. It's hard to buy the old AGP 2X 1X video cards or motherboards these days but you may run into them. That's why it pays to be careful. That's especially true if you're buying used hardware. Each AGP card has one or two slots in its card edge. If a video card has the 3.3 volt slot, then it can use 3.3 volt signaling. If it has the 1.5 volt slot then it can use 1.5 volt signaling. If the card has both slots then it can use both signaling voltages. The newest version of AGP added support for 0.8 volt signaling but it did not add a new kind of slot. If a video card supports either 1.5 volt or 0.8 volt signaling then it has the 1.5 volt slot. The AGP connectors on the motherboard are keyed to prevent insertion of AGP cards which would be damaged if plugged in. An AGP 3.3V motherboard connector can only accept AGP cards which have the 3.3V slot. If you try to insert a card without a 3.3V slot into an AGP 3.3V motherboard connector, the card will bump into the connector key and cannot be inserted. Likewise an AGP 1.5V motherboard connector can only accept AGP cards with the 1.5V slot. An AGP universal motherboard connector has no keys and therefore can accept any kind of AGP card. An AGP card with both voltage slots can be plugged into any kind of AGP motherboard connector. If you can plug an AGP card into an AGP motherboard connector, then they are compatible. So you need to check to see that the video card can fit into the motherboard connector to know if they are compatible. This page gives you a more detailed explanation of the rules AGP compatibility. You can still get video cards for PCI slots but they tend to be obsolete and overpriced. The selection is very limited. Many low-end computers come with integrated graphics rather than a separate video card. This is done to cut costs. Unfortunately, integrated graphics are very poor performers at 3D graphics. If you don't play games, then integrated graphics may be just fine. But if you'd like to increase the graphics performance then you need to add a "real" video card. Unfortunately, some computer manufacturers make some low-end models with integrated graphics which do not have either AGP or PCI-Express x16 slots. You should never buy such a computer. Integrated graphics are okay as long as you have the option to upgrade if you need to. But if you buy one of those bad low-end machines then your only graphics upgrade option is to use a PCI slot. PCI will be a serious performance bottleneck. And you'll get stuck buying an expensive, obsolete, PCI video card. The best way to avoid this miserable fate is to avoid buying these crippled computers in the first place. Make sure that your new computer has an AGP slot or (preferably) a PCI-Express x16 slot. It will save you lots of grief (and money) if you decide to upgrade your graphics system. When purchasing PCI video cards you need to be careful about compatibility with the PCI expansion slots on the motherboard. There are two things which vary in PCI expansion slots: the voltage, and the number of bits. PCI Slots can support either 3.3 volts or 5 volts. PCI has a system of keys which only allows expansion cards to fit into the motherboard connector if it provides the correct voltage. As shown in the picture above, a 5 volt PCI motherboard connector has a key near the right end. A 5 volt PCI expansion card has a slot which lines up with the key. That allows you to plug a 5 volt PCI card into a 5 volt PCI connector. You can see a "real" PCI connector in the motherboard picture above. 3.3 volts is similar but its key is near the left end. This system allows you to plug 5 volt cards into 5 volt PCI connectors but not into 3.3 volt PCI connectors. Likewise, you can only plug 3.3 volt cards into 3.3 volt PCI connectors and not into 5 volt connectors. 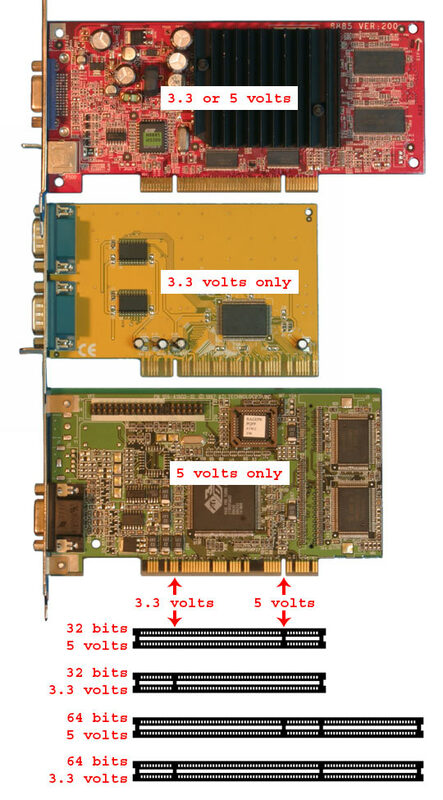 If the expansion card can run on both 3.3 and 5 volts then it has both slots and fits into both 3.3 and 5 volt PCI motherboard connectors. PCI expansion slots also support two different widths: 32 bits, and 64 bits. The 64 bit motherboard connector is longer than a 32 bit connector. Most PC motherboards come with 32 bit slots but some come with 64 bit slots. A 32 bit PCI expansion card will work fine in a 64 bit slot. PCI video cards are 32 bit cards. Most PCI slots on PC motherboards are 32 bit, 5 volt slots. Most PCI video cards are also 32 bits and 5 volts. Many of the PCI video cards also support 3.3 volts. As a result, most PCI video cards work fine in most PCs. However, there are some motherboards out there with other kinds of PCI slots. 64 bit, 3.3 volt slots are common in workstation-oriented motherboards. If you want to use one of those then you'll need a PCI video card which supports 3.3 volts. So, before purchasing a PCI video card it's a good idea to make sure that the PCI video card and motherboard are compatible. If the PCI video card fits into the motherboard expansion connector then they're compatible.